​Approach Shot Strategy: When to Attack​​​For most amateur golfers, breaking 100 for the first time is a big, celebratory event. It’s an amazing feeling that will make you feel like you can conquer the world. 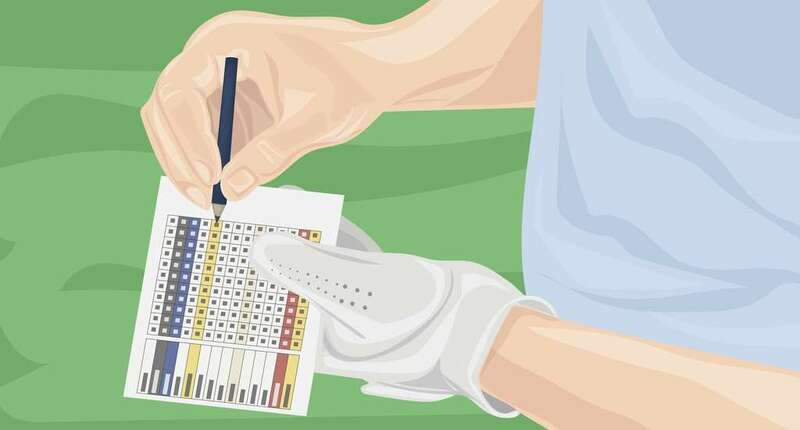 Even though it’s only one stroke, a 99 is a much better score than 100. And it’s not as difficult as you might think to finally shoot in the 90’s. Most players over complicate the process by buying more expensive clubs and making too many swing changes at once. But breaking 100 is all about managing your game and setting realistic expectations. Are you averaging a 103 right now or 120? If you’re 15-20 shots away from the magical 99 you might need to set more short-term goals first. Once you’re shooting around 107 or less you can implement these fundamentals and strategies to help you finally break 100. Here everything you need to learn to finally break 100 for the first time ever. Believe it or not, you don’t need any pars or birdies to break 100. What you need to do is play the percentages, have a game plan, and try not to be a hero. Remember, your goal is to break 100, not 80 for the first time. Keep this mindset throughout the round, especially during bad shots or a bad string of holes. Your number one priority should be to get the golf ball in play as often as possible. If you see trouble when you step on the tee box and don’t trust your driver, put it back in the bag. Opt to hit a 3 wood, 5 wood or even hybrid. Choose a club that you are confident that you can keep on the course and in play. Out of bounds and lost balls make it easy to get triple bogeys and the dreaded snowman. These are round killers, not only for score but your confidence as well. 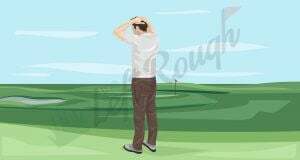 Hitting a tee shot on a road or in the desert can make you frustrated and even try to fix your swing on the course. But if you keep the ball in play you will give yourself many more chances for the 9 bogeys and 9 doubles needed to break 100. If you can keep it in play off the tee you will increase your odds significantly to get the ball close to the green in regulation. Remember, your goal is to break 100, not 80. In 2018 Henrik Stenson leads the PGA Tour for greens in regulation at 74%. The best players only hit ¾ of the greens in regulation! If you hit even 4 or 5 greens you have a great chance for shooting in the 90’s. This should be a huge relief and eliminate pressure to feel like you need to hit more greens. The biggest tip for your approach shot is to take enough club! 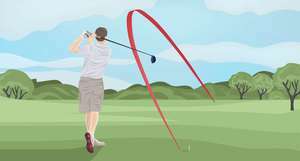 So many beginners try to swing hard with less club and end up chunking or sculling their approach shots. Ditch the macho mentality and take enough club to make it to the center of the green. Once you understand the two main priorities to break 100, here are four basic fundamentals to get you started to shooting in the 90’s. Slices plague at least 80% of amateur golfers. Slices kill distance, bring in trouble on the right side of the hole, and can be a confidence killer. Your slice might be for a variety of reasons but the most common is a weak grip. A weak grip gets the club off plane and produces an over the top swing motion. The number one quick fix to tame your big slice is to strengthen your grip. If you strengthen your grip you will create a more in to out swing path which will help promote a draw swing. 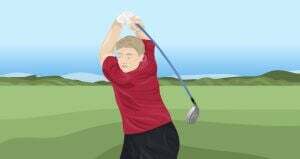 You will also have a more closed clubface at impact which will minimize your slice off the tee. Watch this video for a quick 1-minute drill on how to strengthen your grip, or read our full post on the grip. If a strong grip still doesn't fix your slice, we have a few more answers in our post on beating the slice. The second fundamental to help you break 100 is to not try to help the ball in the air. The club is already designed to make it happen for you. 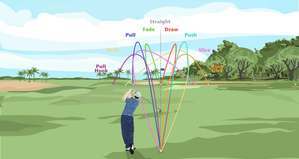 But most amateur golfers get in the habit of wanting to help the ball get airborne. Instead of assisting the ball up you need to hit down and chase through the ball. The loft on the club will make the club go high and land soft. 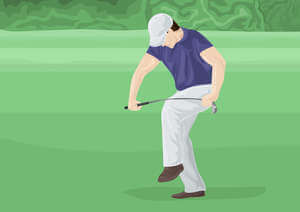 You must hit down and have your divot in front of the ball, not behind it. You should aim for bacon strip divots, not chunky, deep pork chop style divots. I’ve written more about how to stop hitting fat shots (and thin ones) but want to mention how important they are to breaking 100. You need to limit these big misses by keeping your posture the same throughout the swing. The only reason you chunk shots it because your posture dips and end up way short of the green. And the only reason you thin shots is because you posture goes up during impact. This is why you make contact with the bottom grooves and sail the green. Strive to keep your posture the same throughout your swing and imagine your head sitting on a fence post. Keep it there during the backswing and follow through to hit more pure, consistent shots. Golf is hard enough, don’t make it harder by playing the wrong equipment. Too many golfers spend their money trying to play superior equipment. Your clubs need to match your game so you don’t have a heavy or stiff shift that is more suited for a low handicap player. I’ve done extensive research to help find the best clubs for beginners. Make sure you are playing the right clubs to give yourself the best opportunity to break 100. Now that you have the fundamentals here are the main shots you will need to get into double digits. To keep it in play you need to have confidence that your tee shot will stay in bounds. Choose a club that will give you the highest chance of putting the ball in play. Whether it’s driver, fairway wood or hitting a hybrid off the tee, find something that works. Even if your favorite tee shot is a 15 or 20 yard cut, plan for it and know that you have a “go-to” shot for the tee box. While you might want to hit the high flop shot opt to chip more than pitch instead. 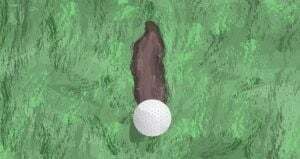 If possible, putt instead of chipping it at all. A bump and run or putting from the fairway is a safer play than a lofted club from a tight lie. The higher the loft the easier it is to stub a shot around the green and invite a big number into play. 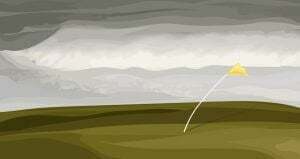 Flight it low so you can get the ball rolling like a putt once your ball lands on the green. Accelerate Through The Putt - If you want to make more short putts you have to get the ball to the hole by accelerating through the stroke. Phil Mickelson talks about this more in his short game secrets videoand is crucial to finally break 100. Most amateur golfers decelerate and leave putts short. Instead of taking a long backswing which promotes deceleration do the opposite. Choose a shorter backswing and accelerate through the putt. If your back and through swing is 100% spend 25% on the backswing and 75% on the follow through to always be accelerating. Keep Your Head Steady - If you want to hole more three foot putts keep your head steady and down through the entire putting stroke. For three footers you should hearthem instead of seeing them go down. Before your next round, practice three footers and make at least five in a row. Keep your head level and listen for the putts to drop. Most amateurs are terrified of the sand. This fear and lack of confidence leads to chunks, skulls, and big numbers. But once you learn the fundamentals the sand isn’t that scary. It’s important to remember the biggest rule in the sand: YOU DON’T HIT THE BALL, YOU HIT THE SAND! Once you realize this biggest rule of the sand it’s a matter of the right setup, address, and speed of your swing. Setup with 70% of your weight on your left (or forward) side. This will promote you to hit behind the ball. 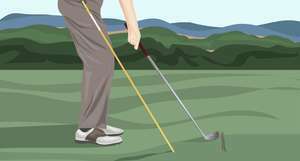 Pick a spot 2 inches behind the ball and focus on it, notthe ball. 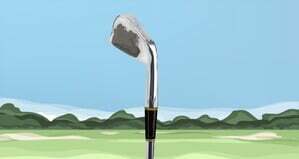 Open your sand wedge and take the club outside slightly (don’t overdo it). Once you’ve mastered these four shots you are close to breaking 100 for the first time ever! Now that you have the fundamentals and shots needed to break 100 don’t forget the game plan. Remember, your goal is for 9 bogeys and 9 double bogeys. If you get a triple bogey or 3-putt from short range don’t worry, stick with the plan. With these strategies you’ll often times get a par or birdie to offset a bigger number. Also, keep your emotions in check during the round to eliminate blow up holes and continue to manage your expectations. To help manage expectation don’t add your score up after 9 or 17 holes. Nothing good has ever come from this and typically hurts your performance on the 18th. If you think you’re close to the magical 99 or less on the 18th keep doing what got you there. Pick a club and shot you love that will keep your tee shot in play. Find an club for your approach shot that will get you close to the green and avoid trouble. Once you’re up there, keep your head steady until you hear the putt drop. Who says golf is hard! !